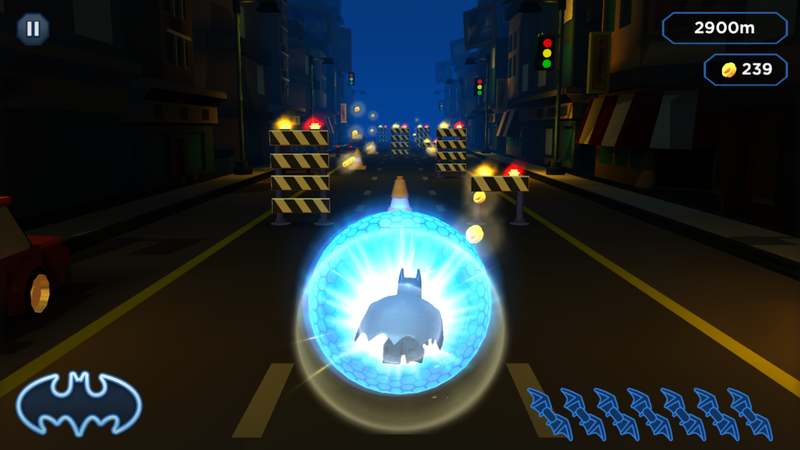 HomePlay On: The LEGO Batman Movie App. 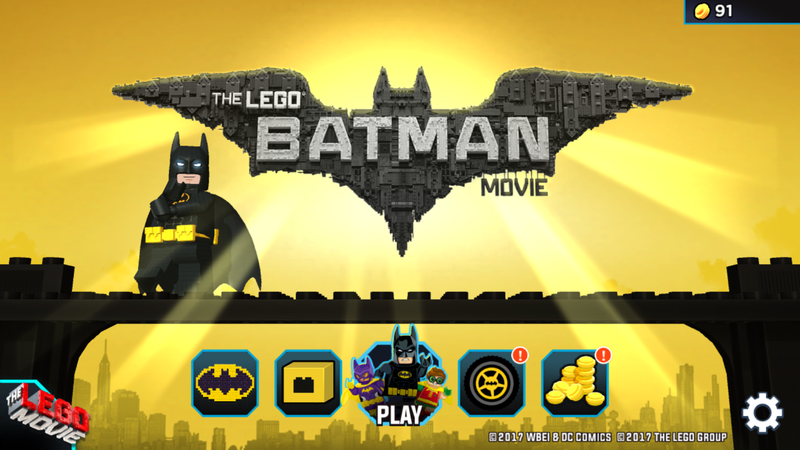 Play On: The LEGO Batman Movie App. 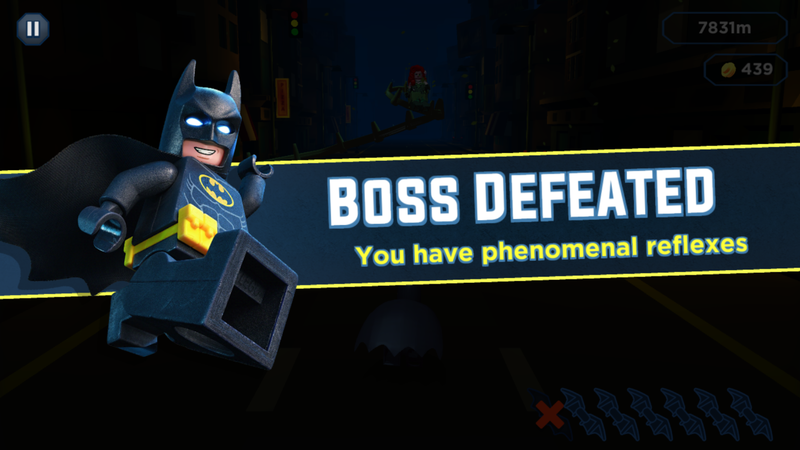 There I was, browsing through my LEGO Life newsfeed, and the announcement leapt out at me: The LEGO® Batman™ Movie App, now available for download. So I visited my App Store of choice and tracked it down. It had the right price: this App is free, with no claim of in-app purchases. But what would the cost be? The opening splash screen give you some options for where to start. 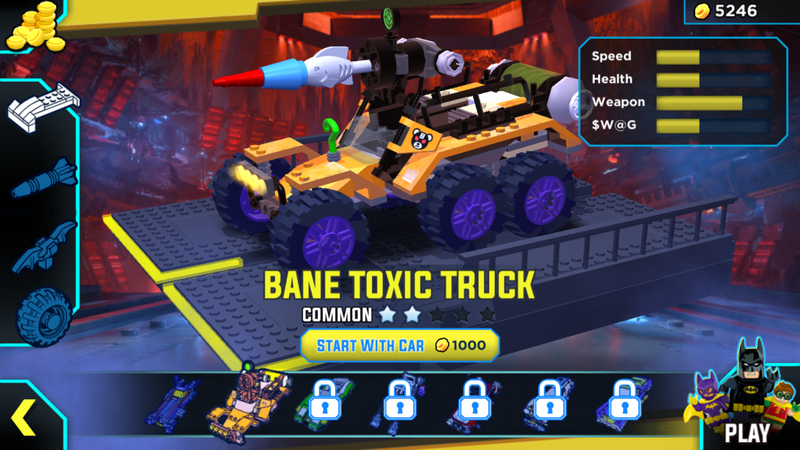 You can choose to watch videos, read about the Lego sets, play the game,customize your vehicle or purchase upgrades in return for studs that you collect around the game.. 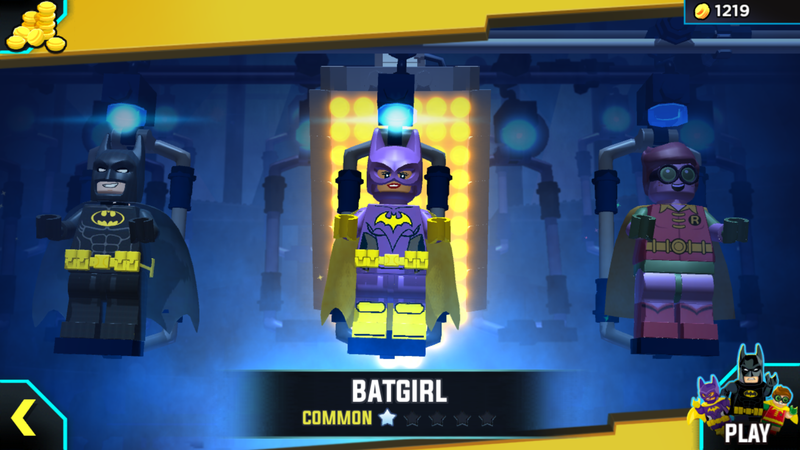 The game starts of interestingly enough: Select your character: Batman or BatGirl with the promise of many others to unlock as you gain the universal unit of LEGO®game currency: the stud. And run. Just run. Dodge, jump over, or slide under obstacles. Occasionally, you may gain the use of a vehicle – initially the standard Batmobile from the movie, but able to be customised – and crash through barricades. Start with Batman and Batgirl unlocked, and unlock other suits in return for studs. Swipe left and right to dodge gates. swipe down to slide underneath gates with lower openings, and swipe up to jump. I found this last one the most problematic, as it was extremely easy to bring up the phone’s control centre, and pause the game. Given I was attempting to jump over an obstacle when I attempted this, as soon as the game was unappeased, I went “Splat!” directly into the object I was attempting to jump. 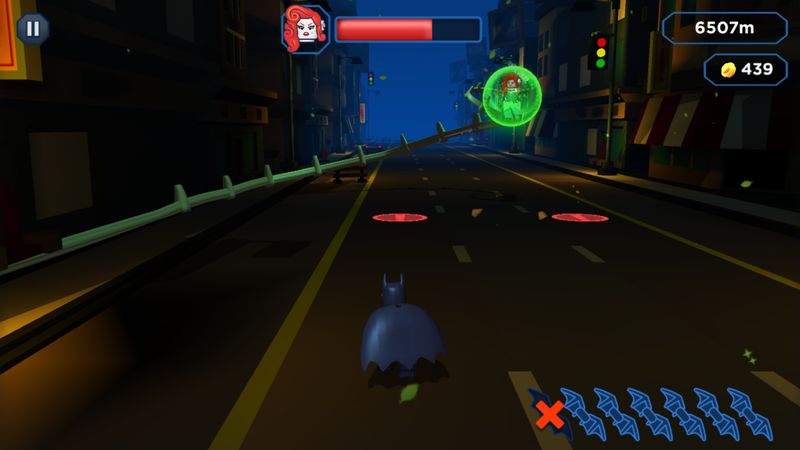 Tapping the screen will throw a Batarang™, and this will destroy the next obstacle in your lane. Batarangs are slow to renew, but a greater supply can be purchased at the upgrade store, to a maximum of eight. Save your life with Fully Sick Beatz! 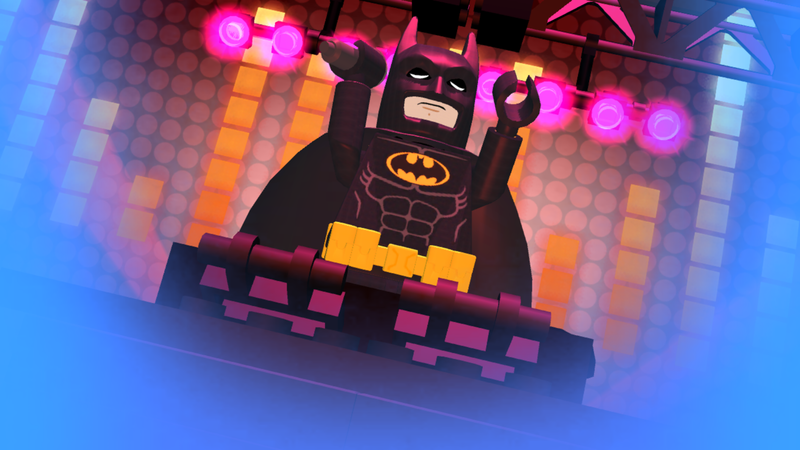 If you crash into an obstacle, you are taken to the mixing desk, where LEGO® Batman™ is laying down some sick beats. An onslaught of studs comes down three paths towards you, and you must hit them as they cross the line. This is made slightly more challenging as, while there is a grooving bass line playing, the taps are rarely to a specific counter rhythm, and they only result in a little ‘ting’. A misplaced tap in this phase results in a comical clown horn, a cow mooing or a different barnyard animal sound. Too many misses and you are returned to the starting screen. If you make it through you continue from where you left off, with a couple of seconds invulnerability. There are three ‘beat box’ rounds available each game, each progressively more difficult than the previous.. You can opt to skip them, which returns you to the beginning of the game. Vehicle – you gain the use of the selected vehicle, until too many obstacles are hit. You can upgrade shielding, weapons, wheels, engine and much more as you accumulate studs. Magnet – after activating the magnet, studs are attracted to you: you do not need to run over them, merely past them. Shield – after activating the shield, you can crash into any obstacle with impunity. 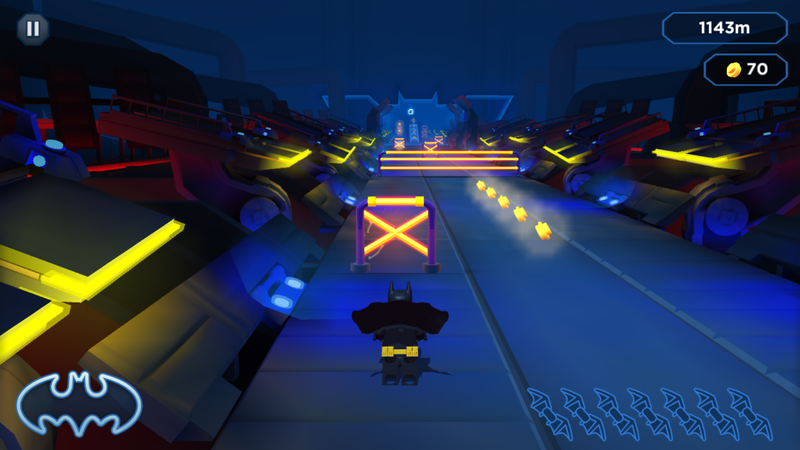 Additional seconds of Magnet and Shield power-ups can be purchased with studs. Studs are gained by picking them up as you run through the track. This is slow and tedious, especially when you are inexperienced. A faster way to accumulate studs in the first instance is to watch videos: after a friendly warning that you are about to be exposed to marketing material, you are directed to the video menu. The featured video (today it was the Ninjago Movie Trailer) gains 2000 points. These points can only be gained once. 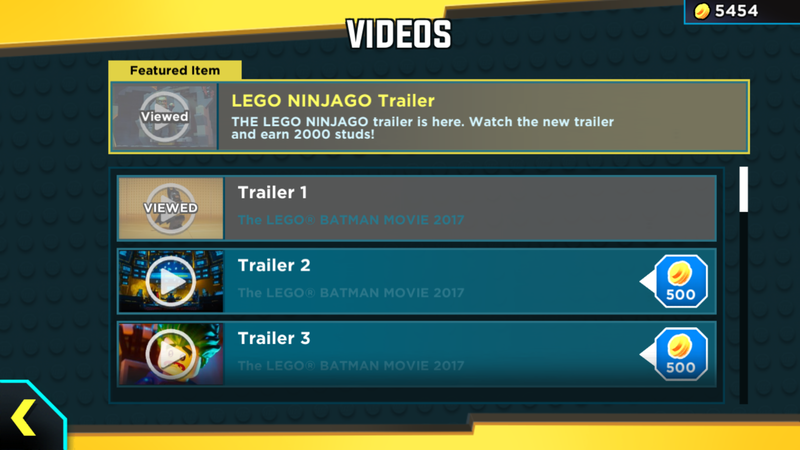 Other videos, describing sets, LEGO® Batman™ Movie trailers and the like are worth 500 studs each. Some challenges will also gain access to bonus studs. The boss battle that I have experience was merciless. 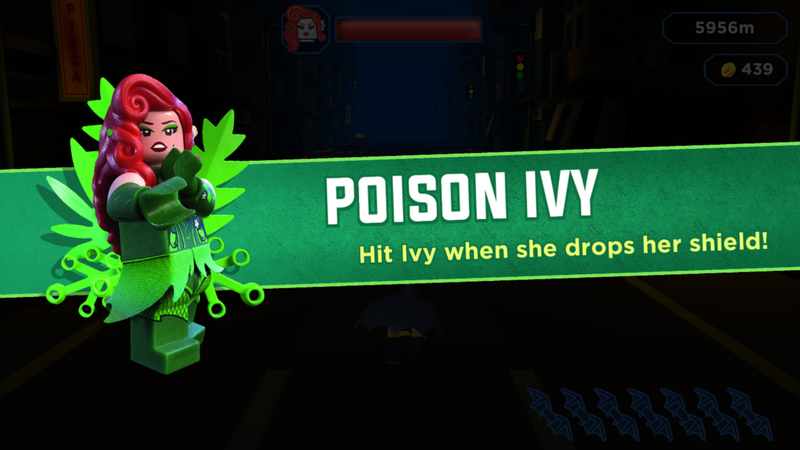 The mission ‘Defeat Poison Ivy’ in order to receive Bane’s Toxic Truck Body. Without clear instruction as to how to play, you learn rapidly: avoid the rows with the red spotlight: this is where her plants will grow, and destroy you if you are in their path. Nothing like a little pat on the back to keep you going! After playing for 2-3 hours, I have made some observations. I believe that the best way to improve your progress in this game is to power up your vehicle with studs, at the store (access through the pile of golden studs on the screen.) You can upgrade wheels, weapons, vehicle health and bonnet decorations/hood ornaments. The faster your vehicle can go, and the stronger the body; the more barriers it can crash through before it is disabled means more progress. You can also upgrade your stash of Batarangs. The easiest way to do this initially is, unfortunately, to consume advertising material, either for movies, or movie related sets. Then it becomes time to consider the missions on offer to get your bonus equipment. There are 8000 studs available for power ups to be gained watching videos. As you can see, this truck is a little more useful than the Batmobile above! It’s free, what’s the catch? The big disappointment for me, playing this game, has been that having completed the first boss battle, I need to complete that one again on subsequent plays before I get to new levels. This is tedious and frustrating, and just so 1981! Perhaps I have missed the instruction on how to start at the second level: if you know I have, let me know. Perhaps it will become more obvious in a future update. My other gripe is the music. It is in keeping with the movie but is loud and brash, and just doesn’t stop! Once I found the setup panel, I was quick to turn it off, and leave it off. In summary, this game is initially enjoyable, but rapidly becomes frustrating, having to cover old ground with every game play. 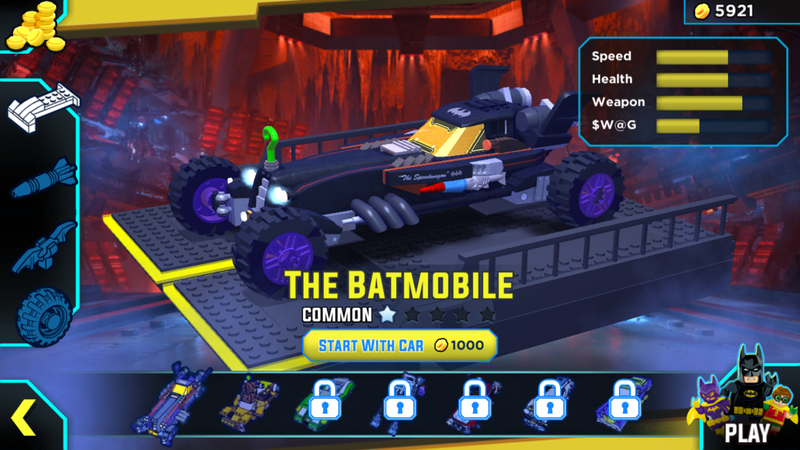 The fun of unlocking new powers on the vehicles, and new batsuits is initially engaging, but rapidly becomes a grind. I give it 2.5 Arbitrary Praise Units. However, I believe I will keep playing it for a while, hoping against hope that I will discover a short cut to level 2, which features new styles of game play. The ‘running man’ challenge of the game doesn’t feel entirely relevant to Batman. Indeed, the game does not really bear any resemblance to the storyline of the movie, beyond Batman, Batgirl, multiple Catsuits and villains. There are no chases, mysteries, clues, real time fights, or family bonding to be seen. I’m not sure what I expected with a free, movie based game, so perhaps I shouldn’t have been too surprised. It probably just leaves me wanting to pick up the LEGO Dimensions story pack for the movie! Have you given this game a go? Are you more successful than I? Or am I just getting old? Let me know in the comments.